Geographical Range: Texas, South America. Nests in the Southwestern United States but is very local in distribution. Habitat: Lowland areas, semi desert, prefers taller vegetation. 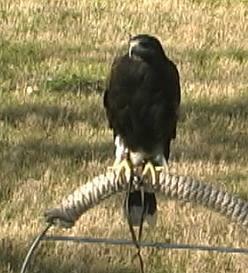 Diet in the Wild: The Harris Hawk feeds on hares, rabbits, birds, and lizards. Conservation Status: Extirpated in the 1960s. 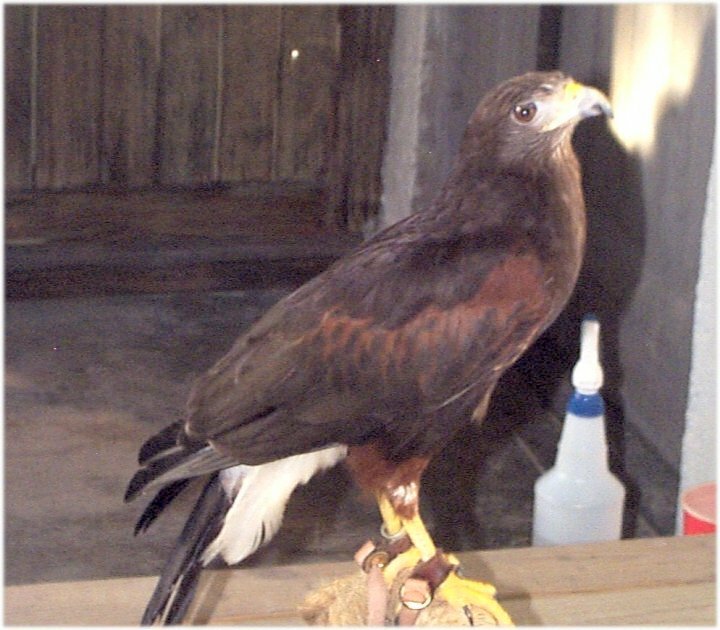 Attempts to reintroduce the Harris hawk occurred in the 1980s, when nearly 200 birds were released along the lower Colorado River (Walton et al. 1988). Medium size: about 18 inches. Weight is about 565-2000 g. Long tail and broad wings. Its color is dark brown with sienna shoulders, underwings and thighs.White feathers under the tail. (Grossman, Hamlet 281). Exhibits the most sophisticated cooperative hunting tactics documented in birds, involving up to six individuals. Members of the group will take turns flushing and chasing the prey until it is captured. (Ellis et al. 1993). On the ground, the hawk may spread its wings over the captured prey ("mantling"). Click here for a photo of this behavior. They have large eyes with sharp vision, but the eyes have a limited range of motion, so the hawk must move its head to keep prey in view. Pairs or polyandric family groups. The additional males help with raising young. The male is about a third smaller than the female and is sometimes called the tiercel. Walton, B., J Linthicum, and G. Stewart. 1988. 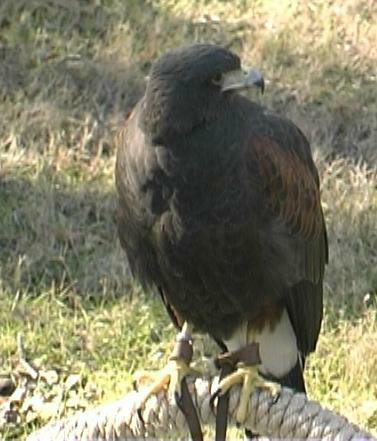 Release and reestablishment techniques developed for Harris' hawks-Colorado River 1979-1986. Pages 318-320 in R.L. Glinski et al. (eds.). Proceedings of the southwest raptor management symposium and workshop. National Wildlife Federation, Washington, D.C.